Respiration isn’t as easy as it seems. This month’s feature article addresses the complexity of living things. Living things are characterized as having metabolism. We touched on the complexity of metabolism in general in that essay. A recent news article about an enzyme called Mammalian Respiratory Complex I [Roman numeral 1] 1 provides us with a specific, current example. Outside the body, when oxygen combines with carbon and/or hydrogen it releases energy in the form of heat and light. This release of energy is called, “fire.” Inside the body, oxygen combines with carbon and/or hydrogen to release energy, but people don’t burst into flames. That’s because the reaction is carefully controlled so as to release just the right amount of energy. It is very much like a nuclear power plant where control rods allow the nuclear reaction to proceed fast enough to produce enough energy to produce the necessary power, but not so fast as to produce too much power and destroy the power plant (as happened at Chernobyl). Let’s ignore all the simple, trivial details ( ) about how oxygen gets through the lungs, into the blood stream, and pumped (along with fats and sugars from the digestive system) through the body to the cells where the release of energy actually takes place. Let’s just focus on the process that takes place in the cells and see how complex that metabolic process is. You may wonder, “Are they such bad writers that they can’t express themselves clearly, or are they just trying to impress everyone by making it seem too complicated to understand?” No, they aren’t bad writers, nor are they trying to make it more complicated than it seems. It really is that complicated. There is a very complicated enzyme in living cells called Complex I which isn’t very well understood. They used an electron microscope to examine a sample of the Complex I enzyme found in cows. They discovered that this one enzyme is made up of 45 parts. Fourteen of those parts are found in all living cells. The other 31 parts of the Complex I enzyme in cows are found generally in other mammals. They were particularly interested in what happens to the enzyme during hypoxia (that is, when it suffers from lack of oxygen). As we said, the abstract was the simple part. Most of the article contains paragraphs like the one below. All you need to really understand is the last sentence and a half, and count the number of NDUFs (and other words you don’t understand). The 18 supernumerary transmembrane helices (TMHs) (Fig. 1b) establish a cage around the core membrane domain. Three TMH-containing subunits, B9 (NDUFA3 in the nomenclature for human complex I), B16.6 (NDUFA13) and MWFE (NDUFA1), interact extensively with PGIV (NDUFA8) on the intermembrane-space (IMS) face, enclosing core subunit ND1. 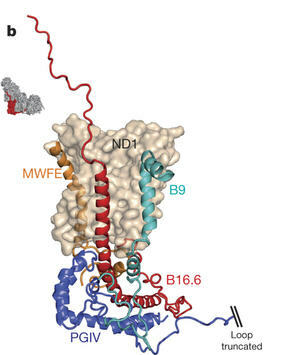 Subunit B14.5b (NDUFC2), bound to ND2, contains two different-length TMHs and attaches KFYI (NDUFC1) to the complex. Three TMHs that interact with ND4 are assigned to MNLL (NDUFB1), ESSS (NDUFB11) and SGDH (NDUFB8). Four TMHs, assigned to B17 (NDUFB6), AGGG (NDUFB2), B12 (NDUFB3) and ASHI (NDUFB8), are bound to ND5. The TMHs of ASHI and B15 (NDUFB4, on the side of ND4) cross the ND5 transverse helix, and the four TMHs of B14.7 (NDUFA11) appear to support ND5-TMH16 in anchoring it against ND2. Four subunits confined to the IMS (PGIV, the 15?kDa subunit (NDUFS5), PDSW (NDUFB10) and B18 (NDUFB7)) form a helix latticework (together with SGDH and B16.6) on the IMS face (Fig. 2a). PGIV, the 15 kDa subunit and B18 contain CHCH domains (pairs of helices linked by two disulfide bonds) and are canonical substrates for the Mia40 oxidative-folding pathway; PDSW probably contains two further disulfide bonds. These disulfide bonds form during complex I biogenesis and are probably important for enzyme stability. Thus, the supernumerary cage has evolved to become integral to the structure and stability of the membrane domain. The first of the two reasons we quoted that paragraph is to convince you that the enzyme is complex. Did we succeed? If not, please go to the Nature website and read the rest of the article, which consists of 18 more paragraphs just like that one. The second reason we quoted the paragraph was the last sentence and a half. They aren’t sure why this structure evolved, but they are sure it happened by chance and natural selection. There’s no justification for that belief. It doesn’t take a PhD biologist to recognize that cells can spontaneously de-activate, and that when cells are dying it can be tough to get them to regain active status before they are irreversibly deactivated. Everybody knows that. The important thing to recognize is that cells don’t reactivate spontaneously or easily. That is, life doesn’t just happen spontaneously. It requires some specific “reactivating turnovers.” Where did these reactivating turnovers come from? All living cells need an enzyme called Complex I to function. This enzyme is so complex that scientists still don’t understand exactly how this one critical enzyme works. But scientists believe (strictly by faith, with no supporting evidence) that this complex enzyme happened by chance in the first living cell. Furthermore, it started out with 14 core pieces, and gradually, accidentally acquired 31 more parts by the time cows evolved. The questions remain, “Specifically, how complex is a living cell?” and “How complex is too complex to have happened by chance?” We can’t answer those questions yet; and neither can evolutionists. They just believe it all happened by chance filtered by natural selection. Trial and error, they believe, caused Complex I to arise naturally. That takes a lot of faith!